"Angelo Mercure has mastered the fine art of storytelling. Most importantly, he keeps you turning the pages." 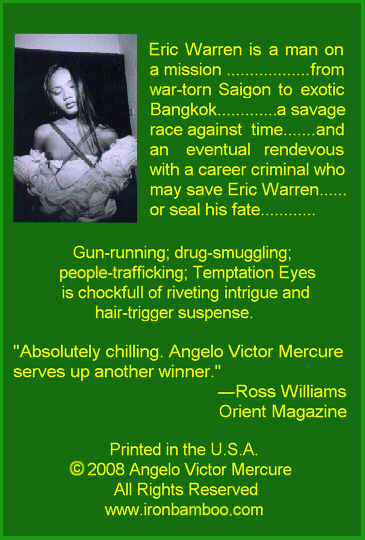 "Angelo Mercure's fiction is dark, frank, and brutal. It calls to mind the very best work of Nelson Algren." "Mercure takes you into a long, dark tunnel full of mists and terror." "Angelo Victor Mercure keeps you turning the pages and he always delivers." "Angelo Victor Mercure scores again." "Mercure is one hell of a writer. This book is one hell of a read!" "I had a very hard time putting this book down until I read it straight through. Intriguing plots and counterplots; fascinating characterizations; heart-pounding narrations; Angelo Victor Mercure is a master storyteller." Ordering information : $10.00 per book, postage and handling included. Overseas/foreign orders: $15.00 per book, postage and handling included.